Here you will find some special suggestions to start to know better Catania. This itinerary also includes a night tips going to clubbing on the beach or in a disco, according to your needs: in this way, you can enjoy the Catania nightlife without worrying about having to leave. We begin our tour from our school that is located in Piazza Duomo, the center of the historical city center of Catania, where you can see the unique Elephant Fountain. The Cathedral, with the Chapel of Saint Agata inside containing the saint’s treasures, and City Hall, Palazzo degli Elefanti, are also in this square. From Piazza Duomo you can walk to the nearby Via Crociferi, one of the most charming streets in Catania, where you can see some wonderful examples of eighteenth-century Baroque buildings, one after the other: the Jesuits’ Church, the Church of San Giuliani and Villa Cerami that host the Faculty of Law. Following Via Antonino di San Giuliano (a road that crosses Via Crociferi) you will find the Benedictine Monastery, where Giovanni Verga, who was from Catania, based his book “Storia di una capinera”. We advise you to go to the ExBenedictine Convent, which is now the home of the Faculty of Literature and Philosophy. This important building, which looks like a palace has inside wonderful gardens with kiosk where you can have a rest to read some book. After visiting the Monastery, it will probably be lunchtime. 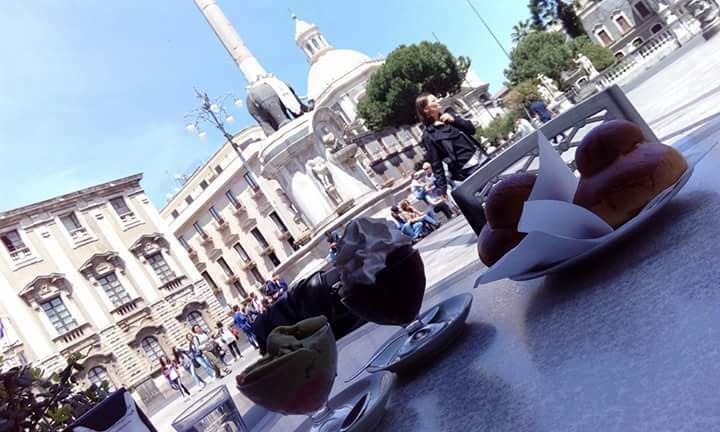 Choose one of the restaurants in Catania nearby and try out some of the delicious Catania food. Why not start off with an arancino di riso, in one of its thousand varieties, and with a delicious “crespella alle acciughe”. As a first course you have to try Pasta alla Norma a classic dish in Catania, that has become one of Sicily’s symbolic recipes. For your second course, choose a fish-based dish: the restaurants in Catania are famous for their fresh fish prepared in several different ways, depending on the chef’s imagination, but that are in keeping with traditional Sicilian cuisine. After a good coffee, you will be ready to continue with your itinerary. Go to Via Etnea, an elegant street lined with Baroque-style buildings and shops that crosses the city from Piazza Duomo to Piazza Stesicoro, where you can see the Vincenzo Bellini Monument, the imposing Roman Amphitheater, one of the few remains from the Roman era that survived the volcano eruption and the earthquakes and the Church of Saint Agata alla Fornace, one of the eight churches in Catania that are dedicated to the city’s patron saint. 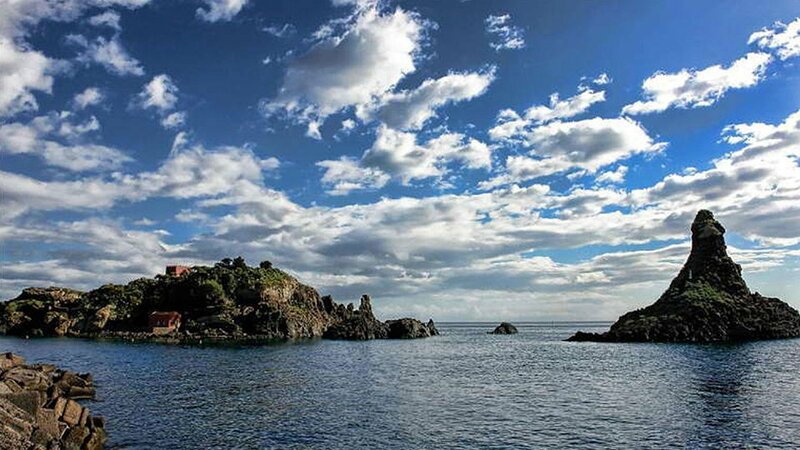 Once you have reached this point, you will be able to dedicate the rest of the afternoon to a relaxing, charming walk in the splendid Villa Bellini, one of the most popular places for the Catania people. 70000 sqm of squares, bridges, borders and fountains. After a day spent looking at places so full of art and culture, the time has come to dedicate a bit of time to enjoyment: Catania leaves you with no end of choice. Go to one of the bars or clubs along the crowded Via Mancini (behind Piazza Università) for your aperitif, one of the most popular meeting points in the city. Carry on the evening as you please: Catania has clubs, especially in Teatro Massimo area’s, for all tastes: from live music to the DJ set, from ethno-rock to electronic music. Try to go to “La Chiave”, “the Stag’s Head” or “Waxy O’Connors”. 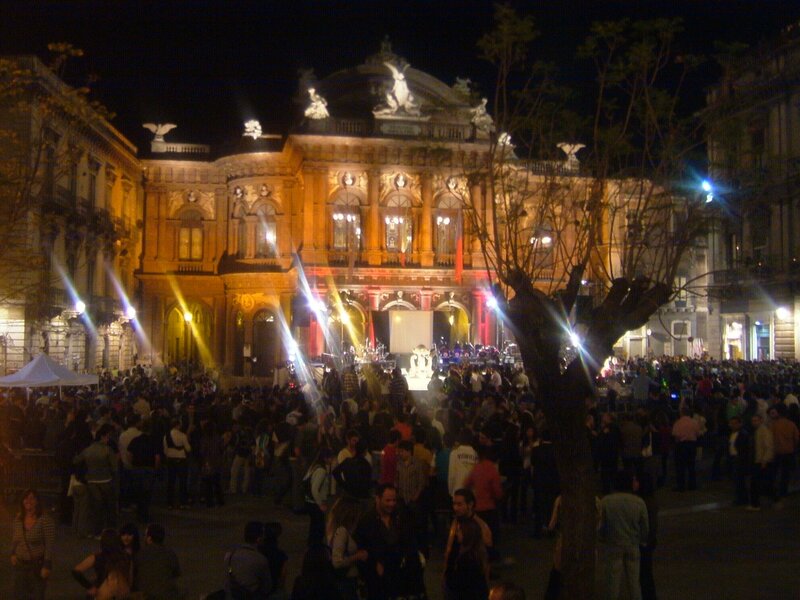 Catania is famous for its legendary nightlife, and not just in Sicily. Legendary to the extent that it has the right to speak about its “movida”. Here is quite normal to have dinner after midnight. After the dinner in Piazza Castello Ursino where you can find typical Sicilian dish of horse meat, one of the most popular meeting places is the Scalinata Alessi, a staircase in the center of the university area of the city, just a short walk from Via Crociferi, where there are lots of clubs. One of the most famous clubs is Nievski, the first pub that opened up in the city. Now there are about 120 of them, that are always crowded and lively. Catania is a university city that attracts students from all over the south of Italy, and they and the city’s “viveur” inhabitants make Catania’s nightlife so interesting that it seems natural to stay out until dawn. In Castello Ursino square there is the famous disco called MA – Music Action that during the winter time represent the starting point of every cool weekend. In summer the nightlife shifts to sea: in the seaside “la playa” there are lots of clubs on the beach. But you have to visit also the seawalk of Acitrezza where you can find different pubs on the coast where will of fun is always on! that goes as far as the seafront. If you get hungry after walking, talking and dancing there is always the Etoile d’oro that was the first bar to stay open 24 hours a day in 1977 and that now makes 1000 arancini per days, offered in a thousand different varieties. The tasty Catania cuisine offers a range of typical local delicacies. Catania’s most famous dish is Pasta alla Norma, a pasta first course with tomato sauce, fried eggplant, basil and lots of salty ricotta cheese. The name came from “Norma”, the most important Bellini’s opera, which opened the Massimo Bellini Theater in 1890. But there are a number of sicilian dishes that you can appreciate with us or directly at the restaurant. Arancini di riso (rice balls) are i.e. one of the most common recipes used in delicatessens and food shops; they are usually enriched with minced meat and sometimes with mushrooms and pistachio nuts. Catania’s “arancini” are different to the ones made in other Sicilian cities as they are long and cone-shaped and not round. Scacciate are another local recipe: bread-dough pies, filled with local cheeses “tuma”, anchovies and different type of vegetables. Fish-based recipes include marinated “mascolini”, fresh anchovies marinated for at least 24 hours in extra-virgin olive oil and lemon juice and “pasta coi mascolini”, pasta with fried anchovies, onion, peas and wild fennel. If you are in Catania you have to taste our cannoli, the most typical Sicilian desserts, made up with crunchy pastry filled with ricotta cheese and chocolate flakes or candied fruit. Another delicacy are icecreams and granite: crushed ice drinks, flavored with almonds, lemon, coffee, or chocolate and served with hand-whipped cream. In summer we use to have cold breakfast with hot briosche or croissant and granita. The kiosks spread out around the city offer special local drinks such as lemon seltzer, made with squeezed lemon, seltzer and salt or tamarindo with lemon and bicarbonate of soda. Olivette di Sant’Agata, cakes with green almond paste made for the traditional festival of Sant’Agata are another Catania delicacy. These little cakes are linked to an ancient legend that tells the story of the city’s patron saint, pursued by Roman soldiers, who stopped running to tie her shoe and just at that moment, a huge wild olive tree grew in front of her that hid her from her pursuers, and offered her olives to eat. Local wines include the DOC red wines that come from the foot of Mount Etna. In Via Reitano, near to Castel Ursino there is a craft shop belonging to the Napoli family, the historical Catania puppet-making family that has made the famous Sicilian “pupi” for centuries and that has given shows at the Theater Opera dei Pupi. The famous Catania “pupi” are made differently from the Palermo ones: they are 135 centimeters tall and can weigh from 15 to 30 kilograms! The craft objects made from lava stone following traditional techniques and the famous painted pottery mostly made in nearby Caltagirone, but which can be found in any souvenir shop in Catania, are extremely characteristic. Another typical craft product that you can find in Catania are candelabras: unique pieces often in Baroque style that are made by hand, mostly in wood, and are carved, decorated and then painted. If you want to dedicate yourself to food and drink products, we recommend you to go to one of Catania’s markets, so that you can experience the true atmosphere of everyday Catania life. The ideal place for such an experience is the picturesque Pescheria, the historical market that spreads behind our school. There are fresh fish stalls (though fish is a little difficult to take home as a souvenir, no matter how good it is), and also dried fruit, bottles of extra virgin olive oil and red wine made on the foothills of Mount Etna, bags of dried pulses for tasty, local recipe soups and lots more too. For those of you interested in shopping for famous names, Corso Italia is full of all the boutiques of the most famous Italian and international designers.